80 Jordanians suffer trouble breathing over the border as Israel struggles to contain 1,000 cubic meter spill caused by car accident. 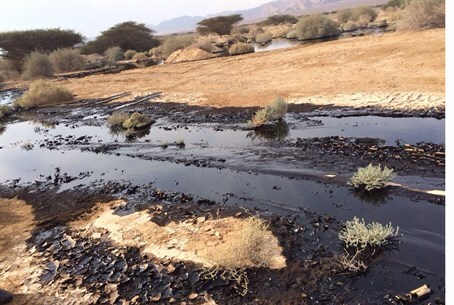 A major pipeline leak has caused oil to gush into the Arava desert in southern Israel threatening a protected nature reserve, officials said Thursday, as roughly 80 people over the Jordanian border sought medical care due to the fumes. The incident took place roughly 20 kilometers (12 miles) north of the Red Sea resort city of Eilat and 500 meters (yards) from the border with Jordan, closing the Arava highway from north of Eilat up to Ketura Junction. The spill was "a couple of kilometers long," according to an Israeli environment ministry spokesperson. Gilad Golub of Israel's Environmental Services Company told AFP that 1,000 cubic meters - the equivalent of 40 tanker trucks - of oil had been spilled. Golub said the environmental damage could be serious, pointing out that the spill occurred in an area that is a protected nature reserve. He said it could take several weeks to clear all traces of the oil, and months to ensure that it had not seeped underground. "We do not suspect an act of sabotage," he added, saying it appeared that a vehicle had hit part of the pipeline, causing the leak. Jordanian authorities said dozens of people there had sought medical treatment because of the fumes. According to Jordanian media cited by Walla!, roughly 80 people were suffering from trouble breathing. However, the gas was not poisonous and most of the cases seen by hospitals were the result of "panic and fear caused by the strange smell," the civil defense department said in a statement. The leak involved a 245 kilometer (152 mile) pipeline carrying crude oil from the southern port city of Ashkelon on Israel's Mediterranean coast to Eilat. Ronen Moshe, spokesman for the Eilat Ashkelon Pipeline Company (EAPC), said the spill happened at 8:45 p.m. on Wednesday night in a new section of the pipeline. "The leak has been stopped," he said. "There are dozens of people in the field taking care of the aftermath." According to the company's website, the EAPC was founded in 1968 and serves as a land bridge for transporting crude oil between the Red Sea and the Mediterranean.